The United States and Canada have long enjoyed very close ties. That relationship isn’t likely to change in the near future, although FATCA – the Foreign Account Tax Compliance Act – has angered many Canadians. 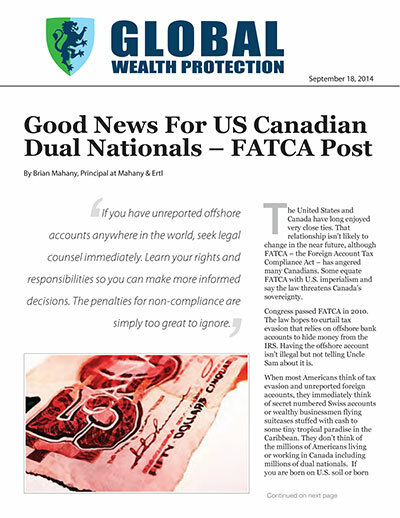 Some equate FATCA with U.S. imperialism and say the law threatens Canada’s sovereignty. Congress passed FATCA in 2010. The law hopes to curtail tax evasion that relies on offshore bank accounts to hide money from the IRS. Having the offshore account isn’t illegal but not telling Uncle Sam about it is. When most Americans think of tax evasion and unreported foreign accounts, they immediately think of secret numbered Swiss accounts or wealthy businessmen flying suitcases stuffed with cash to some tiny tropical paradise in the Caribbean. They don’t think of the millions of Americans living or working in Canada including millions of dual nationals. If you are born on U.S. soil or born to an American parent, you are considered a U.S. citizen. Two weeks ago, two Canadian American dual nationals filed suit against the Canadian government over the government’s agreement to enforce FATCA. It appears, however, that enforcement may not be universal. Before folks get too excited, the Canadian government is promising to require Canadian banks to tell the IRS about account holders with ties to the United States. While some folks think that is a violation of Canadian privacy rights, the U.S. says it will provide the same information to Canadian tax authorities. So where is the rub? The controversy occurs with dual nationals. The Canada Revenue Agency (CRA) says it won’t help the US IRS collect penalties against dual nationals or Canadian citizens. According to an article in IFC Review, in 2012 the CRA’s chief of the Income Tax Rulings Directorate said that the Canada Revenue Agency would not assist the US with a “revenue claim” against a Canadian citizen. That ruling came in response to a situation involving a person who was a U.S. citizen by birth but later became a naturalized Canadian citizen. American law requires U.S. taxpayers to disclose all foreign financial accounts if the aggregate value of those accounts exceeds $10,000. The term U.S. taxpayer includes U.S. citizens, dual nationals, green card holders and foreigners working in the United States. Under the U.S. Bank Secrecy Act, these folks must file an annual FBAR form (Report of Foreign Bank and Financial Accounts). Failure to file FBARs carries huge civil penalties that can exceed the high balance of the unreported account! Under the new FATCA law, Canadian financial institutions will soon be reporting account information to the IRS. The IRS, in turn, may use that information to penalize Canadians who are subject to reporting. The CRA says, however, that it may not be willing to assist the IRS in collecting those penalties. There is no word if the CRA will change its position in light of the new Intergovernmental Agreement between the United States and Canada regarding FATCA. If you have unreported offshore accounts anywhere in the world, seek legal counsel immediately. Learn your rights and responsibilities so you can make more informed decisions. The penalties for non-compliance are simply too great to ignore.